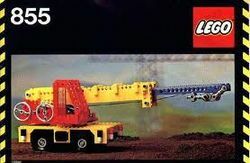 855 Mobile Crane is a TECHNIC set released in 1978. It contains 512 pieces to build a mobile crane. The set features a mobile crane with a rotating superstructure, an extendable boom that raises and lowers, and a movable hook. Typical of early TECHNIC sets, the crane is multi-coloured. This set is the same as 955 Mobile Crane. Facts about "855 Mobile Crane"